Very nice machine and one that is on my list for 2012 in blue or green. That machine really has a nice typeface. Have a Very Happy & Prosperous New Year! They put this body on other models. I have a "futura-istic" one badged "All-American" That I got over the Summer. I really like the "e" on this typeface. Very distinctive! I have a Royal Futura 800 in blue that needs a small amount of help. Everything works fine on it, but the blue on the very top has faded some. How would I go about refurbishing it? There really is no problem with the typewriter other than the paint starting to fade. My goal is to get it in tiptop condition and possibly sell it. Thank you! Hi Merlyn. All I can suggest is you sell it as it is, and let the buyer decide what he or she wants to do about the top. You could respray it yourself, but you'd have to own up to that in the listing description, I think. The top in the images you see on this post was resprayed by me. just found one of these in the attic.... not sure where to even sell something like this, or find worth. So far it looks like 1958, it is silverish in color. I've read and enjoyed many of your posts, but I first came upon this particular entry today. 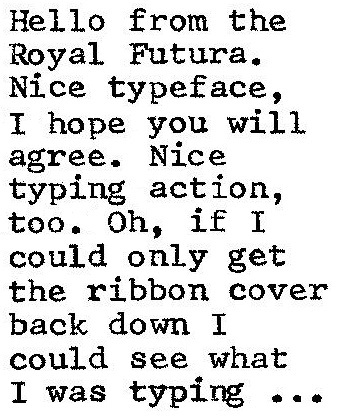 By an interesting coincidence, yesterday I bought a Royal Futura identical to the one in picture at the top of the post. 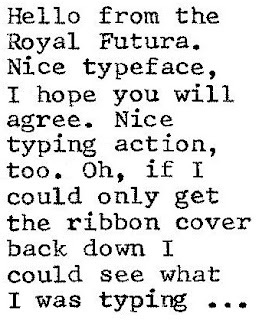 And in another coincidence, the featured typewriter for October on my typewriter wall calendar was the Royal Futura. 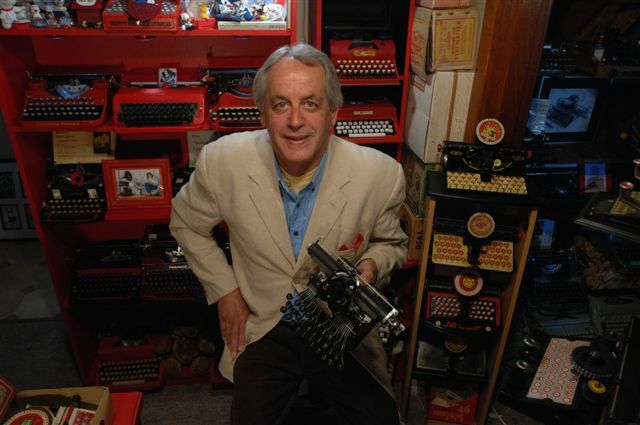 I have a small collection of manual typewriters and was pleased to be able to add the Futura to it. This particular machine is in really nice condition and types well. And I got a good deal on it. The guy who sold it to me said he got it at an estate sale and that as far as he can tell, it had never been used. I don't know about that, since one of the clasps through which the ribbon is threaded is loose, but it smells freshly-oiled. In any event, I've already put it to use. Again, I enjoy your blog.